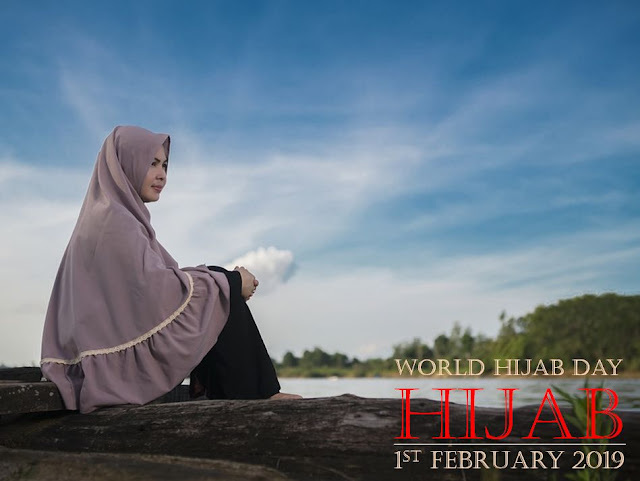 World Hijab Day - 1st February 2019 ~ Islam My Ultimate Decision . Hijab for Muslim women is not only a sign of modesty but also a Commandment from Allah, which makes it obligatory for Muslim women to wear clothes as ascribed for them in the Holy Qur'an. I have already written a detailed post on the subject in one of my earlier posts, in which I have also classified that what world calls Hijab is in fact called Khimer in Arabic. However, since world understands Hijab what actually is Khimer, we shall use the same world so as not to confuse the issue. In most of the non Muslim countries, Muslim women observing Hijab are often treated badly and some even pity them for following a religion which oppresses women and their basic human rights. Some so called outward looking Muslim women who feel ashamed of following the teachings of the Holy Qur'an and thus inadvertently support those who consider Hijab as a symbol of oppression and divisiveness. Hijab thus makes Muslim women a visible target and have to often bear the brunt of anti Islam forces. In order to counteract Hijab related controversies World Hijab Day is being observed annually since since 2013, founded by Nazma Khan, a New York based Muslimah. The event takes place on February 1st each year in 140 countries worldwide. Its stated purpose is to encourage women of all religions and backgrounds to wear and experience the hijab. Event organizers describe it as an opportunity for non-Muslim women to experience the hijab.